Available April 1st, a luxury one bedroom with ample closets and extremely high ceilings and incredible light. 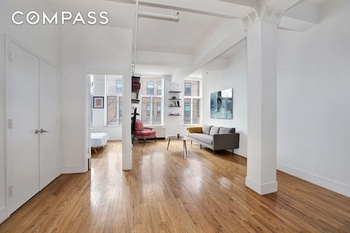 Available April 1st, a luxury one-bedroom with ample closets and extremely high ceilings and incredible light. This 828 square foot one bedroom comes complete with top of the line appliances in the kitchenette, an open living space, and tons of windows. Clinton Lofts is an elevator building in charming Clinton Hill that offers lofty urban living, just minutes away from Manhattan. Thirty tastefully renovated and thoughtfully designed warehouse loft condos with double-height ceilings, oversized windows and private outdoor spaces. Flooded with light, these unique layouts offer modern design and spectacular city views as well as a common roof deck. Enjoy the recently restored Fort Green Park and take walks under mature trees to local coffee shops and boutiques. Clinton Lofts is surrounded by architecturally rich buildings and is on the doorstep of the culturally significant Pratt Institute. Clinton Hill is a valuable find treasured by its residents, and those who complement the new up-and-coming community.